Hello, my name is Tom Bourlet and welcome to the start of my video series. 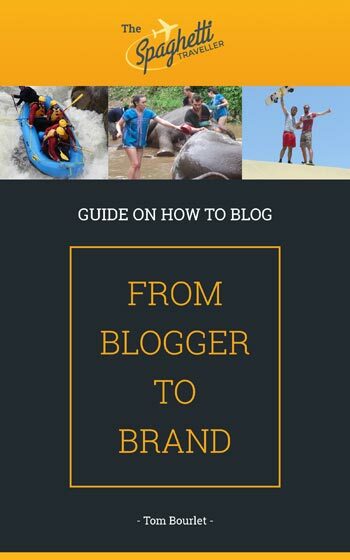 Today I’m going to be talking about Peru, somewhere I went for a month in 2013. I loved every minute of it, It’s probably my favourite country in the world at the moment. 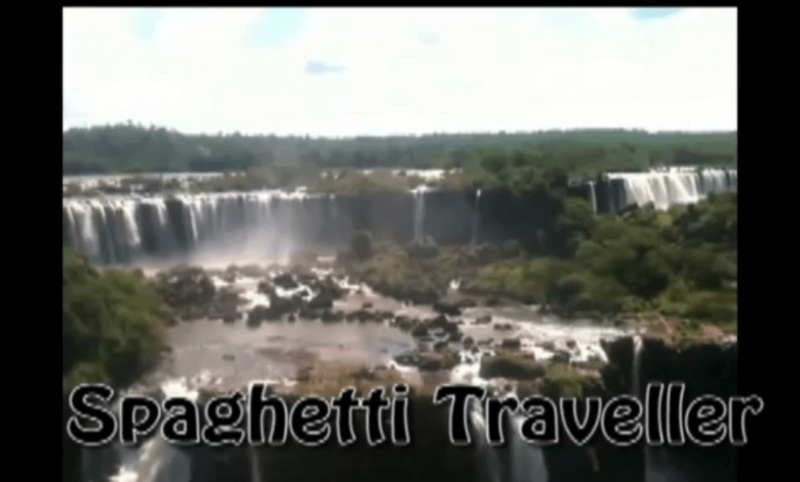 Every experience I speak about on this cam show will be on the Spaghetti Traveller, I have detailed each experience on a separate blog post, so this will just be an overview of the entire country. The first spot for many is Lima. This is because this is where the airport is. I’m not going to lie, it’s not the nicest place I’m ever going to go to, so if you have a choice I’d skip it, but most people fly into Peru and if you’re flying into Peru then you will go to Lima, so try and keep it to one or two days if you can. If you are there, I’d definitely check out the Monastery of San Francisco. As part of this tour, you get to see the catacombs below, which is really cool. So that was good fun. I’d also recommend the Magic Water Circuit. If you’ve never heard of it, have a quick Google. It’s quite a good sight to see, so it will fill the time. Also, if you’re into surfing, it’s very popular in Lima, in fact it’s very popular all over Peru, but you can do it in Lima. The only issue is, while you will have the waves and the wind, it rains every day of the year, without fail, plus it isn’t the greatest, it was very cold. Your next stop, as I mentioned, surfing is huge in Peru and all along the North West coast surfing is massive in different locations. The one that I found seemed to be everyone’s favourite is Mancora. People who went there loved the hostel, they partied pretty hard when there, so Mancora was definitely a top option if you wanted to try out surfing. There are classes for all different levels, so it doesn’t matter if you’ve never done it before. Next along you have Iquitos, which is basically your entrance into the Amazon rainforest. 60% of Peru is made up of the Amazon rainforest, so I think people underestimate how much of it is actually jungle. Iquitos is a place I recommend going to, it’s very expensive so this is one of those ones where you have to work out how long you are going travelling for, how long you need your budget to stretch for. So if you’re going for a short trip then definitely check out Iquitos, but if you’re on a long trip, good luck to you! If you do go, try out a cruise, as their are a lot of cruises that go through their. You can also help look after sick animals, so it’s definitely one for people who like wildlife. Back down to Lima again, if you were to head down from Lima, your first stop should be Paracas. This is one right along the coast again. Here you get to see the Islas Ballestas. This is basically known as the poor man’s Galapagos Islands. They’re really good fun, it’s a lot cheaper than the Galapagos and you get to see plenty of animals, such as seals and wild birds. I really enjoyed it, I did it for my birthday, which was great fun. The other thing is the tour is at about seven thirty in the morning. 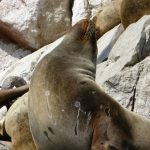 There is nothing else to do in Paracas, so if you travel there in the evening, you can then do the tour first thing in the morning and leave all your bags in the hostel. Then once you finish the tour, you can then come back and grab your bags and head onto a coach. As part of the Ballestas tour, you’ve also got the Paracas National Reservation tour, which is all included and that was really good as well. You will get some great photos, you can check them out on my site and it was all really good fun. From here, as you will want to head on as soon as you are done with the tour, the next stop is Ica. BUT, here is the important bit, you actually want to stay in Huacachina. This is right next to Ica and is absolutely unbelievable. 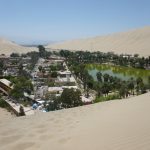 Huacachina is an oasis in the middle of the desert and is beautiful, you have to check that out on my site, either look up ‘things to do’ or the sand boarding post I’ve written. One of the top things I recommend doing is sandboarding and dunebuggying. They get you all in a dunebuggy, about six of you and they fly over the dunes at incredible pace. You are going really really fast, it’s really good fun and there isn’t really any danger (don’t quote me on that, haha) and once you get to the top of the dunes you sandboard down. That is amazing fun! One safety tip, I did it standing up, because I’m an idiot, but a lot of people said they’ve heard of people getting broken arms and broken legs from standing up, so what most people do is they lie down on the board. Actual guides themselves recommend you lie down on the board. So if you are a bit nervous about damaging yourself, it’s apparently a lot more dangerous than skiing and snowboarding, not that I’ve ever tried that, so I’m not sure why I stood up straight away, but it had to be done! In the evening it’s worth climbing up the sand dunes for sunset. Bring some food and drink with you and what sunset, I thought it was a really nice moment. Be careful with your camera, sand got in my camera and it broke, so that was the end of that one! Beyond that, there is a great bar called Huacafuckingchina. You get really well priced drinks there and everyone heads there in the evening, so it ends quite messy in this place. For food, for your hangover day, La Casa De Bamboo. 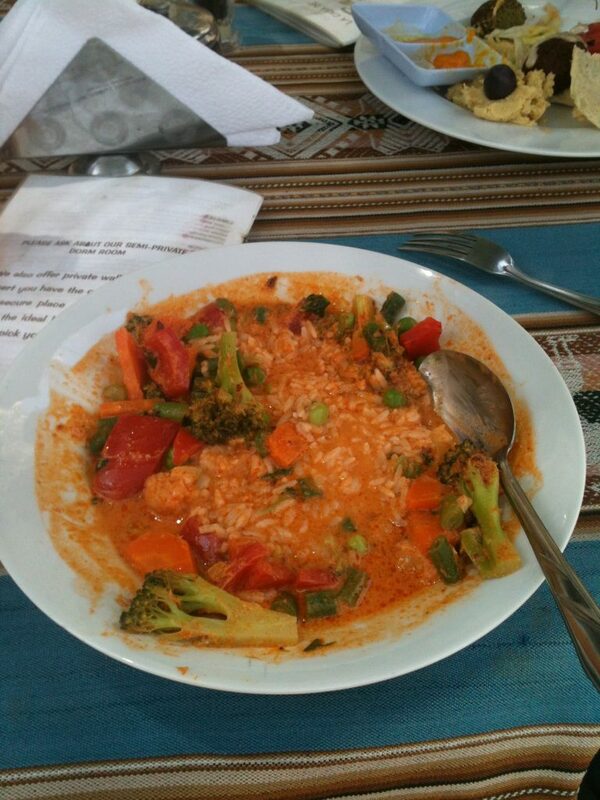 This place did an amazing Red Thai Curry, it was unbelievable, it made me miss home. They don’t tend to sell Asian food anywhere in South America, I found this was the only place. I grew up on Indian and Thai food, despite living in England, so this was amazing. One extra bit you need to know about Huacachina, which isn’t the nicest thing to bring up, is that you might need diarrhea tablets and rehydration tablets. It’s not the nicest thing to talk about, but they are quite essential as there are swimming pools in this area and you will accidentally swallow water. Further on from this, you can visit Nazca. This is where you will get to fly over and see the Nazca lines. My friend got motion sickness from this flight and so did quite a few people I know. It’s a very small plane, it’s just you and the pilot, but it is a mind blowing experience. Just be aware that if you get motion sickness, you WILL on this flight, so just be careful. Make sure they are certified for flying, their are some frauds in this area! 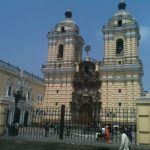 Next is Arequipa; Arequipa is almost like a gateway to a couple of things you can do. From Arequipa I booked the Colca Canyons (all these things that you book, book it in the hostel, the day before you do it). With the Colca Canyons you can do a two or three day trip, I’d recommend the three day one, as you actually get to appreciate it much more. You can also do mountain biking down a volcano in Arequipa, that’s really good. I really would love to see someone with pictures, as I had no camera. White water rafting was really good fun, I’m absolutely hooked to white water rafting, it’s amazing. Also you can learn Spanish quite cheaply in Arequipa, so that’s worth giving a try. The next one, Cusco. Cusco was my next destination, you could actually go Cusco and then Arequipa if you wanted. This is the gateway to Machu Picchu, so it’s a well known area. You’ve got several choices for the Machu Picchu treck. You can do the jungle treck, which involved white water rafting, zip wiring and mountain biking. The mountain biking was so much fun, it was second to Death Road in Bolivia for fun, it was just mind-blowing. Beyond the Machu Picchu treck, you can also explore Pisac market which is really good. You’ve got all these traditional crazy witch market stuff, it’s really interesting and there is a great tour of the markets. I’d recommend getting a massage, it sounds like an odd thing, but actually I got one and it was amazing and it cost the equivalent of two pounds, so I was happy to get these all day. There is also the chocolate museum, that was really good, then you’ve got a cafe at the end where you can try everything, including a cup of melted chocolate! That was good! Next, the final place I’m going to speak about is along Lake Titicaca. You’ve got several place you can go to, such as Puno, but it’s up to you to make a decision. I would take a look at the floating islands and do a complete exploration of Lake Titicaca, it’s an unbelievable experience and this is where you head into Bolivia. 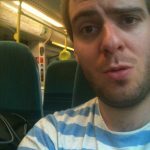 I hope this was useful, I’ll chat to you soon!